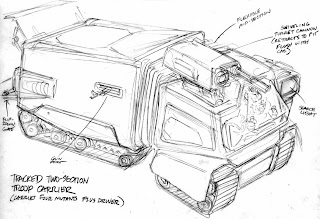 Both of these were drawn by me, probably around 1988 or 1989, and were done as concepts for vehicles in the Playmates Toys TMNT line. 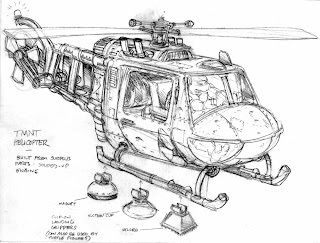 The top drawing is of a TMNT helicopter, and one of its interesting features is the lineup of various "landing grippers" -- magnet, suction cup, and velcro -- that would attach to its landing skids. We had considered -- and I think I even did a sketch of it -- making these into accessories for the Turtle figures also, so that they could be stuck to many different surfaces. In the 2003 line, I think one of the turtles had a similar "suction cup" accessory. And Happy New Year to Peter and everyone here! I sometimes wonder what could have been if Turtles had broke the mold before their final season. They did it in shows like Thundercats. Getting rid of the mutants for good, villains working on their own without Mumm-Ra. We didn't see things like this until the final year of TMNT...with the Technodrome being seen without shred head...for instance. A few new vehicles and mutant bad guys would have livened the series up a bit. Fun characters like Titantis where a good start, though..
.. i want that Transport, Neil ! !